Fall is a beautiful time of the year, with all the colored foliage, the crisp, cool air, and all that goes with it. But fall also brings with it the specter or war and all its ugliness. It was October 14, 2006, the day of the first battle in the War of the Leaves. It is an annual conflict of reasonably large proportions. Our double lot is fairly large, about two-thirds of an acre, but most of it is wooded, so the yard itself isn’t very large; it takes only about 20 minutes to mow the grass. Even with the weed eating added in it is less than an hour’s work most of the time. 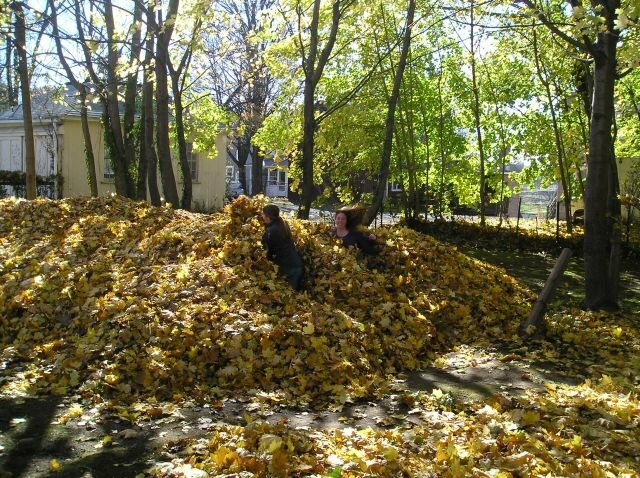 So, even though there are dozens of deciduous trees on three sides of our house, and even though those trees produce hundreds of thousands of leaves each year, clearing the yard of leaves each fall shouldn’t be a big challenge. Right? The man who built and owned this home before we bought it was an engineer. He used his talents to do a couple of good things to the house, including designing and implementing a series of tiers out back behind a rock wall that lines the deck so that the steep hillside won’t slide down onto the deck, but he also selected and planted or installed every conceivable piece of flora and devices to catch and hold leaves after the fall from the trees. So what should take three or four hours of raking/blowing/vacuuming takes far longer. In the past clearing the thousands of leaves around our humble abode has taken me and the boss 25 to 30 hours of manual and tool-assisted labor. We rake, we use the blower, we use the vacuum, we hand pick leaves out of the numerous plants. The weather is an additional factor, of course. Sometimes it's cold. Sometimes it's wet. And sometimes the wind blows the leaves back where they were before we gathered them into piles. 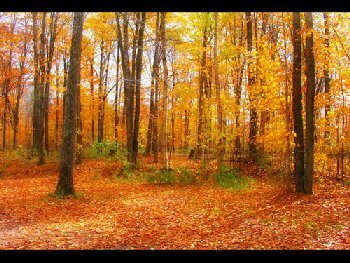 The little good news about this ordeal is that once the leaves are accumulated, instead of having to bag them up we can just rake or blow them into the woods on the downside of the hill. And, there's the exercise element. I suppose all that activity is a good thing. Incidentally, neither of these photos is of my yard, but the lower photo gives you a good idea of what we face each year. So it is with not much enthusiasm that I look ahead to the successive battles in the War of the Leaves. I know I have everyone’s sympathy.